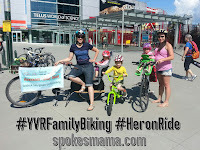 Saturday we met up with some other Vancouver Family Bikers & rode along the seawall to the heron colony in Stanley Park, then on to Second Beach for a picnic & some playtime. Linnaeus has recently started riding his bike on the road with me, to the grocery store or the park, so we decided to bring his bike with us & let him ride on the seawall. 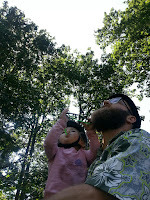 I flipped up his training wheels, then strapped the 16" bike to the back of our Yuba Mundo. Towing worked well--I'll definitely do that again. 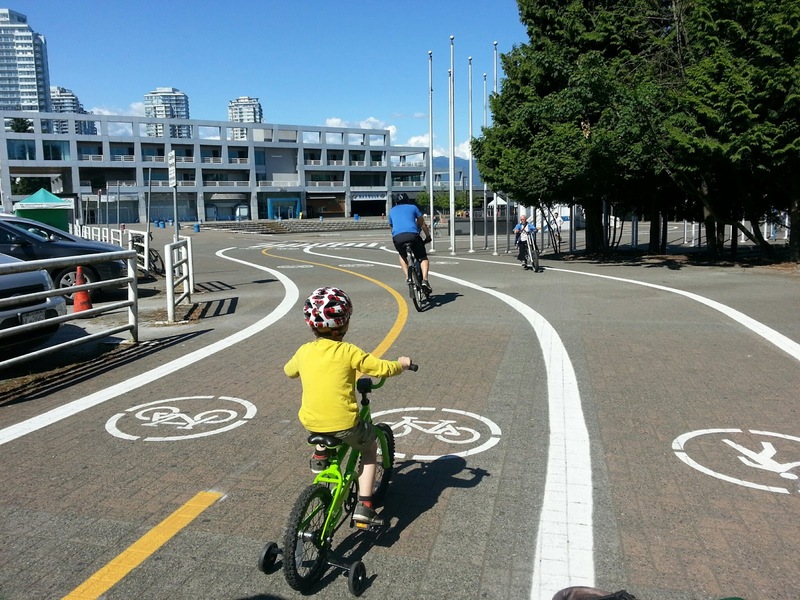 Once we got too Science World, Linnaeus was excited to start riding. He still gets a bit distracted by what's around him & has trouble on the hills, but he's already noticeably better with just a week of riding on the roads. The seawall was busy, but navigable, especially since we were going pretty slow at Linny's pace. 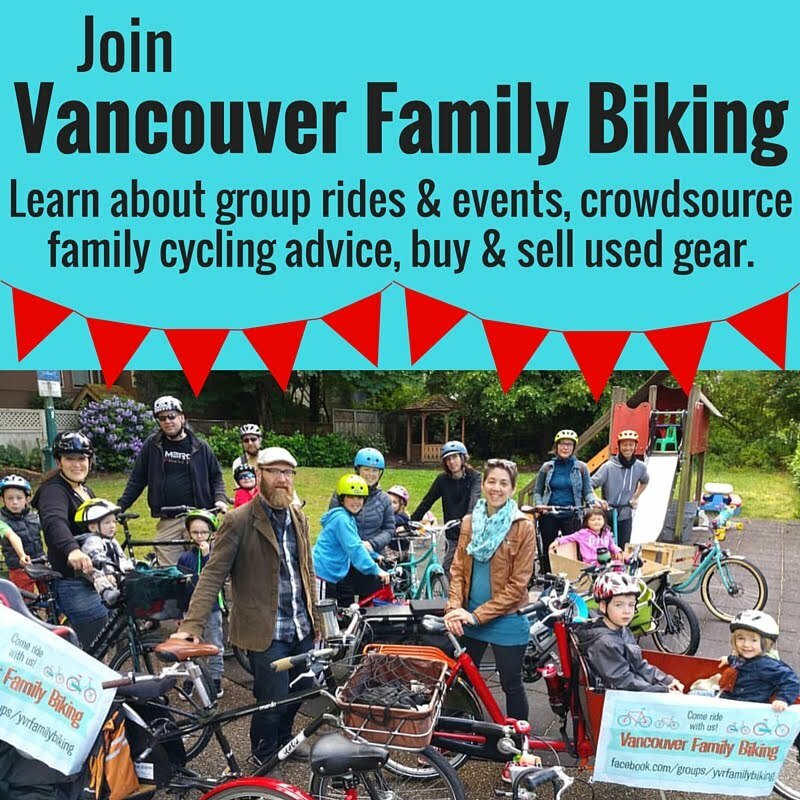 Going slowly meant we had time to chat about biking with babies & kids with Diana, one of the newer members of Vancouver Family Biking. The weather was incredible-sunny but breezy, so it wasn't too hot. When we arrived at the stand of trees next to the Stanley Park tennis courts where the herons make their nests, it was very stinky & there was quite the cacophony of heron squawking. We saw a little through the leaves, but mainly heard, the chicks fight over food when the parents return to the nest with a fish. Seeing herons flying just reminds me of dinosaurs--pterodactyls, maybe. Here's a short video of the heron nests, as seen from the ground under the trees. You should be able to hear a couple of chicks fighting over the fish that one of the parents brought to the nest shortly before I started filming. Next stop was the playground at Ceperley Meadow--all the kids played there for a while & grazed on the picnic lunch we'd brought. 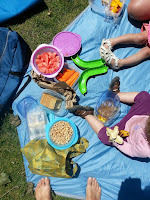 We packed our sun shelter & a picnic blanket, as well as some toys, so we were pretty well set up. After the kids played at both playgrounds, we relocated to the beach. 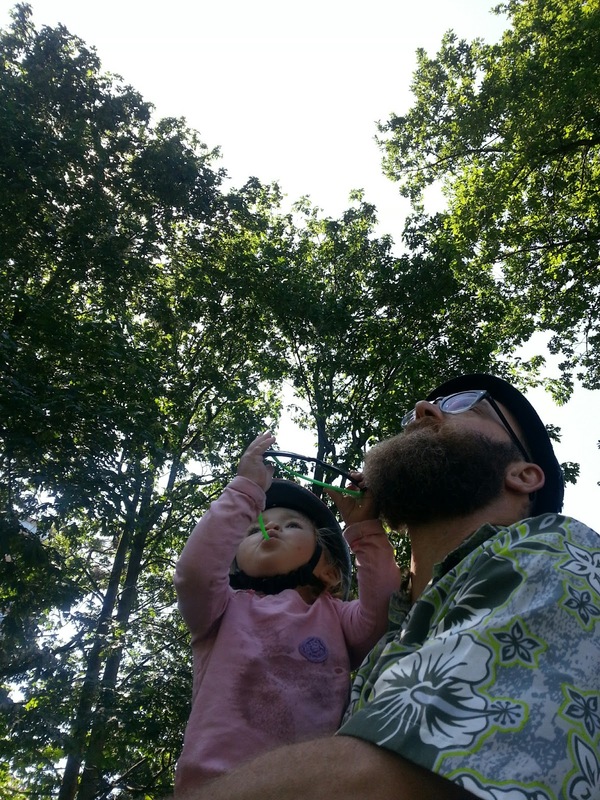 We got to see a float plane fly low right overhead, a hovercraft pass by twice, & a heron fishing in the water in front of us. There was a fruit stand set up next to the concession, so we bought & scarfed down a box of raspberries. I couldn't believe how many people were were on bikes--it was actually tricky to get back onto the bike path in some places because there was so much bike traffic in the park. I loved seeing so many grinning faces going by, enjoying the ride & the day. We saw a wide variety of bikes along our ride: many tandems, including a few recumbent ones, a few hand-pedalled bikes, electric bikes & scooters of all kinds, a few other cargo bikes, & some kids riding on their little bikes. 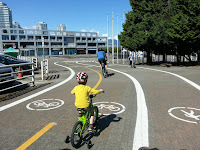 Linnaeus was the only one on the seawall with training wheels. I'm very proud of how far he rode: nearly 13km total! 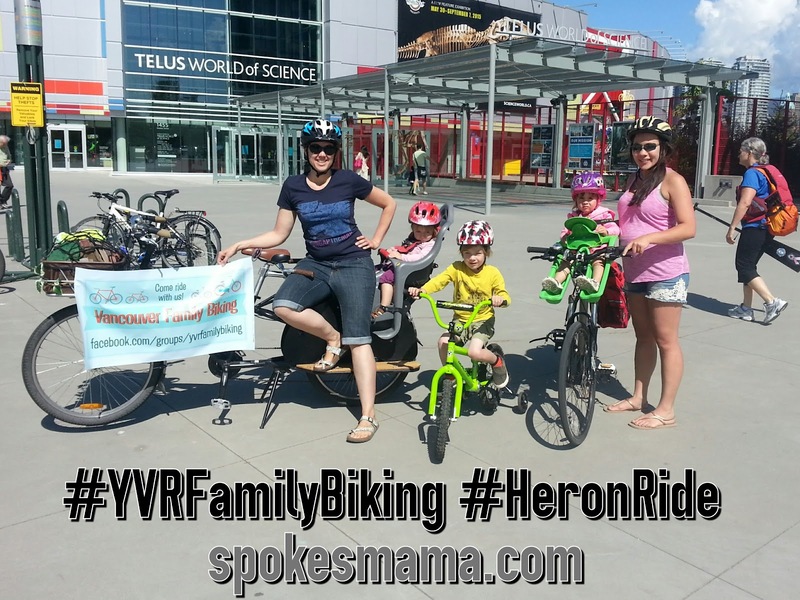 Can't wait to go on the next Vancouver Family Biking ride! The next one we have planned is Canada Day. We haven't decided where to ride yet--if you have any ideas, please let me know! Hope to see you there!